A Brown pelican is carried to safety after a rescue from a local highway on Tuesday, Jan. 16, 2018, near Brownsville, Texas. Representatives from Texas Parks and Wildlife and Texas A&M University rescued many pelicans as they attempted to land on the highway during an Arctic cold front. Unmarked birds were measured, sexed, tagged and released back into the wild. After years of pelican fatalities on Highway 48, the Texas Department of Transportation is nearing a solution to stop the deaths and to mitigate the hazard the birds pose to motorists. The first reports of brown pelicans landing on the stretch of highway connecting Brownsville and Port Isabel that features 75 mph speed limits occurred last Monday when the Texas Department of Public Safety reported that motorists struck and killed more than 40 pelicans. The fatal incidents occur as soon as cold weather moved into the Rio Grande Valley, just like clockwork, year after year. The problem is when a strong north wind blows in, pelicans try to fly in from the Brownsville Ship Channel into the Bahia Grande, where they nest, but because the highway runs east to west, its northernmost concrete median creates a vortex that makes it difficult for the pelicans to overcome the barrier, causing them to drop onto the highway. Those barriers are expected to drastically change by next winter, said TxDOT Spokesman Octavio Saenz. Right now, those barriers are solid. A previous study determined that as north winds of around 30 mph interacted with the northernmost barriers on Highway 48, it created a phenomenon of a negative air vortex. “We determined a vortex existed and we did an alternative barrier analysis,” Saenz said. That’s where the concept of the concrete rail was born. TxDOT’s studies show that if those barriers had passages for the air to pass through, that vortex would be mitigated. “We can’t tell the pelicans not to land on the road but we can do two things, one, mitigate mortality by reducing the vortex and two, asking people as they are driving during the cold front to be keenly aware of what’s going on,” Saenz said. DPS has also been warning motorists to slow down in the area during cold weather because while a pelican might end up dying, the birds are also a danger to motorists. Right now, Saenz said TxDOT is in the preliminary stages of design and are pursuing a funding source. He said the agency expects to have the project concluded in the fall of 2019. In the meantime, TxDOT has flashing signs out there warning motorists of the birds. “And we just ask the public for their help and just being aware of their speeds as they see fit,” Saenz said. In the mean time, a team of volunteers working with DPS, the U.S. 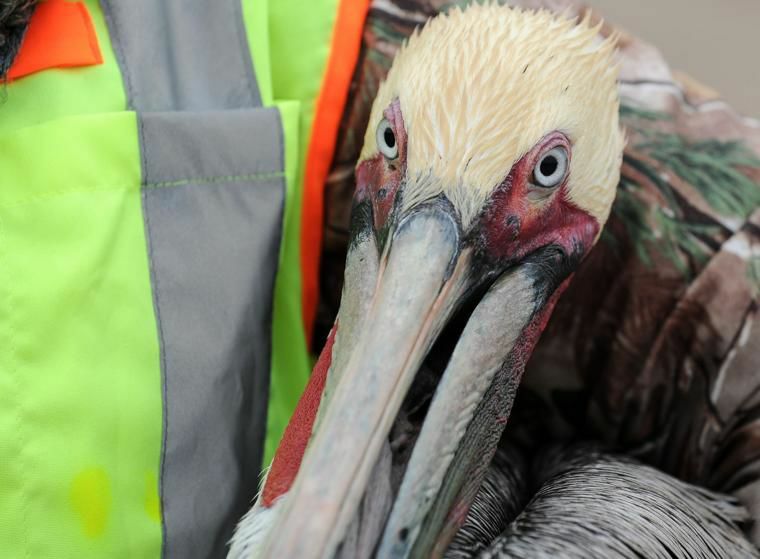 Fish and Wildlife Service, Texas Game Wardens, Port Isabel Fire Department and Cameron County Emergency Management will be positioned out on Highway 48 during conditions that are fatal to the pelicans in an effort to rescue the birds and to prevent accidents. Boyd Blihovde, refuge manager at Laguna Atascosa National Wildlife Refuge, said he is glad TxDOT has committed to doing something to eliminate the barriers that cause fatal conditions for the pelicans and alleviate the problem. Blihovde also praised the volunteers who take their time to station themselves on cold days next to the highway in an effort to save the lives of pelicans.